صلاح الدین ایوبی (۱۱۳۷، تکریت - ۱۱۹۳، دمشق) ایوبی‌لر سلاله سینین بیرینجی حاکیمی ایدی. ↑ Spevack, Aaron (2014) . 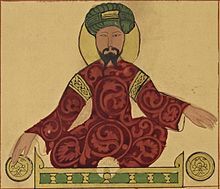 The Archetypal Sunni Scholar: Law, Theology, and Mysticism in the Synthesis of Al-Bajuri. State University of New York Press. p. 44. ISBN 978-1-4384-5371-2. ↑ Lēv, Yaacov (1999). Saladin in Egypt. Brill. p. 131. ISBN 9004112219. ↑ Halverson, Jeffry R.; Corman, Steven R.; Goodall Jr., H. L. (2011). Master Narratives of Islamist Extremism. Palgrave Macmillan. p. 201. ISBN 0230117236. ویکی‌آمباردا Saladin ایله مربوط فایل وار. بۇ صفحه‌‌ سوْن دفعه ‏۲۵ نوْوامبر ۲۰۱۸، ‏۲۱:۱۵ تاریخینده دَییشدیریلمیشدیر.